(AUSTIN, TEXAS - Sept. 6, 2017, source: Juice Consulting) - The 53rd annual Trail of Lights powered by H-E-B has been announced for Saturday, Dec. 9 and will run through Saturday, Dec. 23. This year's official grand opening of the Trail will be on Saturday, Dec. 9 where admission will be free. The Trail will remain open Dec. 10 - 23 with general admission gates open at 7 p.m. every evening. General admission for children under 12 is always free at the Trail of Lights. There will be a general admission fee on seven of the 14 nights of the event. Early entry ZiP Fast Pass, VIP Platinum, parking and shuttle passes are also available for purchase on select nights. Calendars for ticket availability and online ticket purchases will be available in early November at www.AustinTrailofLights.org. "This is the sixth year that the Trail of Lights Foundation has produced this community event, and we are very proud to offer this unique celebration of all that Austin is known for," said Trail of Lights Foundation Board President, Leah Davies. "2017's event is a culmination of a great year, highlighting the people, music, groups, food, technology, charitable organizations and businesses that make Austin the place we love to call home. Visitors will see new modernized displays, interactive environments, Austin's famous food trucks, local musical talent, movies, local merchants and more." *Sunday, Nov. 26: The annual Zilker Tree lighting starts the holiday season off in Zilker Park. Now in its 51st year, the Zilker Tree is the largest man made holiday tree, built around a historic Austin moontower. Food vendors and other merchants will operate at the tree throughout the month of December. Check the Austin Trail of Lights website for schedules. *Saturday, Dec. 2: The sixth annual Trail of Lights Fun Run, a 2.1-mile course, starts at the Zilker Tree and takes runners through the iconic Austin Trail of Lights, ending with a celebration in the park. Up to 10,000 runners are expected to participate in two waves. General registrations will begin in mid-September. *Dec. 3, 4 and 6: The fourth annual STARS at the Trail hosts up to 20 nonprofit organizations for private tours of the Trail. Since 2013, STARS at the Trail has provided an opportunity for more than 2,500 school children, teens, families of varied socioeconomic backgrounds, youth in foster and adoptive care, WWII veterans, mentors and mentees, chronically ill patients and others with unique circumstances to create special holiday memories at the Trail of Lights. For some of these attendees, this trip to the Trail of Lights may be their only holiday experience. *Tuesday, Dec. 5: Spirit Night, a private night hosted by Spirit 105.9 Radio and numerous area churches, will take place Dec. 5. *Friday, Dec. 8: Night Lights, the third annual Preview Party will benefit the Trail of Lights Foundation. The event features headline entertainment, food samples from local Austin restaurants and specialty activities not available during the general run of the Trail. Tickets start at $75 per person and will go on sale in early November. *Sunday, Dec. 10: The fifth annual UT Night will turn the Trail of Lights burnt orange. The evening features special programming, entertainment and private hospitality tickets for University of Texas at Austin students, faculty, staff and alumni. *Tuesday, Dec. 12: The sixth annual HEROES Night honors first responders-active police, fire and EMS, active military, veterans. Guests will create holiday letters to send to troops and other activities to pay tribute to first responders' service. 2017 will be the sixth year H-E-B has served as Title Sponsor. The company has committed to serve as title sponsor through 2019. Additional multi-year sponsors include Vista Equity Partners, Seton Healthcare Family, Keller Williams International, Cirrus Logic, Silicon Labs, T5 Foundation, NXP, Maudie's Tex Mex, the University of Texas at Austin, Austin Parks Foundation, ABC Home and Commercial and Watkins Insurance. The Trail of Lights welcomes new sponsors including St. David's Healthcare as Fun Run title sponsor and local McDonald's owners of Central Texas. 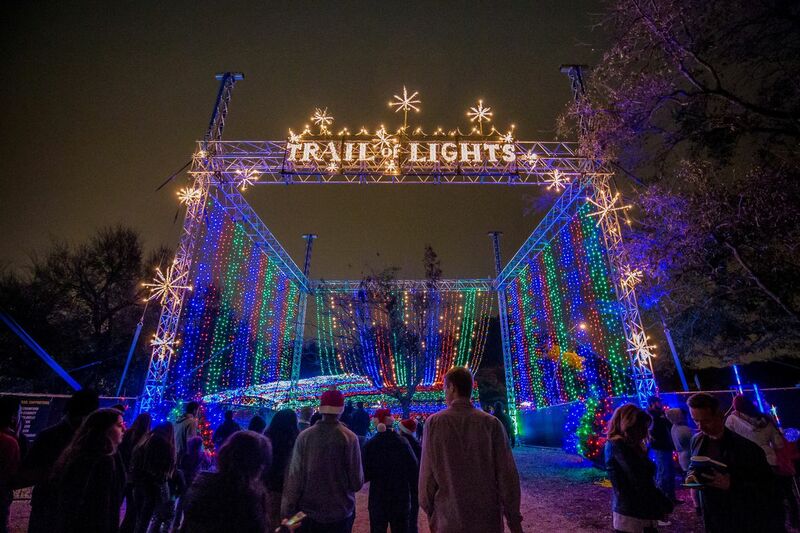 The Trail of Lights Foundation is an independent nonprofit corporation dedicated to producing the Austin Trail of Lights as an authentically Austin community celebration. The organization raises the funds from donations by individuals and the business community to produce and ensure the long-term sustainability of Austin's largest community celebration. It is curated in close conjunction with its long-time partners, Forefront Networks and 3Can Events, who provide turn-key production, marketing, sponsorship and programming services to the foundation. The Trail of Lights has remained in the top three Austin events since the Trail of Lights Foundation adopted the event in 2012. Please see www.austintrailoflights.org for more information on The Trail of Lights.